Ok, confession time. This is one that I kind of made. One of my dear friends got married this weekend and SHE made her bouquet our of antique broaches. She collected them from her grandmother, mother, grandmother-in-law, and from antique stores. But, there was a part of the bouquet that I helped with. She wanted the lace changed, hot glued, and pinned on the part she was supposed to hold. Of course, this is when the kindergarten teacher comes in handy....I am a professional "gluer." Here is the gorgeous bouquet!!! A couple of weeks ago, I decided that every once in a while, I will blog about personal things along with my teaching posts. Here are some pictures from her beautiful wedding that was in central California on a wine vineyard. The theme and style of the wedding reflected them perfectly, and I wanted to share. Ashley is also a teacher, and we went to college together. Watching her walk down the isle to her future husband was one of the most beautiful moments. It was a small wedding, so as she walked down, she was able to make eye contact with all of the guests. Tears streamed down everyones' face as we shared her special moment with her. For part of their photos they were taking pictures on horses! They both entered the reception on horseback! 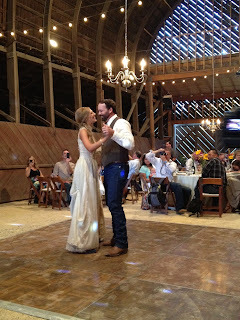 The reception was inside a beautiful barn and this is a picture of their first dance. 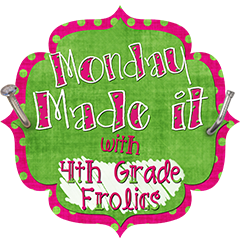 I hope you can link up with 4th Grade Frolics for Made It Monday! I love the bouquet, it looked like a beautiful wedding. Thanks for sharing. LOVE the vintage flower bouquet! Beautiful flowers!!! I love the wedding photos. Who knew barns could be that beautiful?!? Oh that's exactly what I would love to do for a wedding.. horses included! Amazing. Very creative...love the barn wedding! Thanks for sharing! It looked like such a beautiful day! Also, thanks for linking up on my "Blogs of Inspiration" page. So unique! Love it! Looks like a beautiful wedding! I LOVE the antique broach bouquet!! How beautiful and unique and such a keepsake! It looked like such a beautiful wedding too. You did a great job with the lace on the bouquet! Looks like it was a beautiful wedding! Hope you will join me for my $20 TPT gift certificate giveaway!